When Femi Cakolli, Qefsere Nishevci, and Bekim Beka started meeting for weekly prayer in 1994, little did they know that their faith would eventually alter the course of Christianity throughout their homeland. Kosovo was an ancient Christian nation, visited and preached to by the Apostle Paul (Rom 15:19), but that identity was eventually overrun by centuries of Islamic rule and dominance. Yet the Protestant church in Kosovo was destined for resurgence—in part through the humble faith of three Muslim background believers. Messiah Evangelical Fellowship, known in Albanian as Bashkësia Ungjillore e Mesisë or B.U.M. (pronounced "boom"), held its rst services in a humble shed that could barely hold 10 people. However, that would not work for long; in the next two years, the church baptized 52 new members. In the three years after that, it baptized another 43. Home groups were formed, and eventually house churches. As Georges continued to visit with the church several times per year, he advised them on church structure and outreach. In 1997, B.U.M. founded Tenda Publishing, Kosovo’s first Christian publishing house in over 300 years. After the Kosovar War from 1998-99, Tenda published survivors' testimonies of salvation through Christ and distributed them among residents and soldiers. As Kosovars sought refuge in neighboring countries, including nearly 90% of BUM’s congregation, their hunger for Christ grew—and upon returning to their homeland, many people rejoiced at church-sponsored feasts and celebrations. After centuries of repression, Kosovo's Christian identity was beginning to grow once again. Between 1994 and 2007, B.U.M. moved through over 10 locations to accommodate their growing congregation, spending nearly $150,000 on rent! A BUILDING TO CALL HOME? However, God is a rewarder of the faithful. In 2015, after a decade of waiting and steadfast hope, the church finally received approval to build. Gifted $150,000 from partner ministries including Horizons International, B.U.M. began construction on their new home. Two years later, in December 2017, the Prishtina community gathered with B.U.M. members to watch Femi Cakolli and Georges Houssney cut the ribbon on the new 9,000 sq. 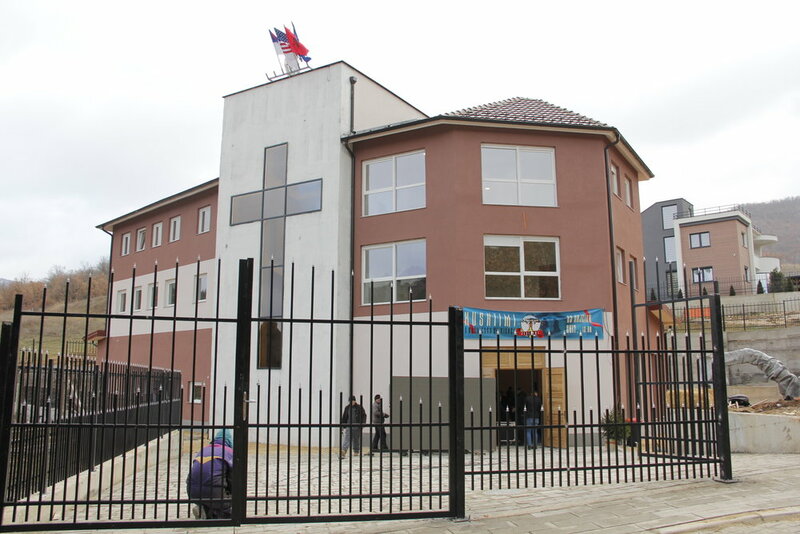 ft. Kisha Protestante Church Center—the largest Protestant church building in all of Kosovo, and the first permitted to be built in over a decade.